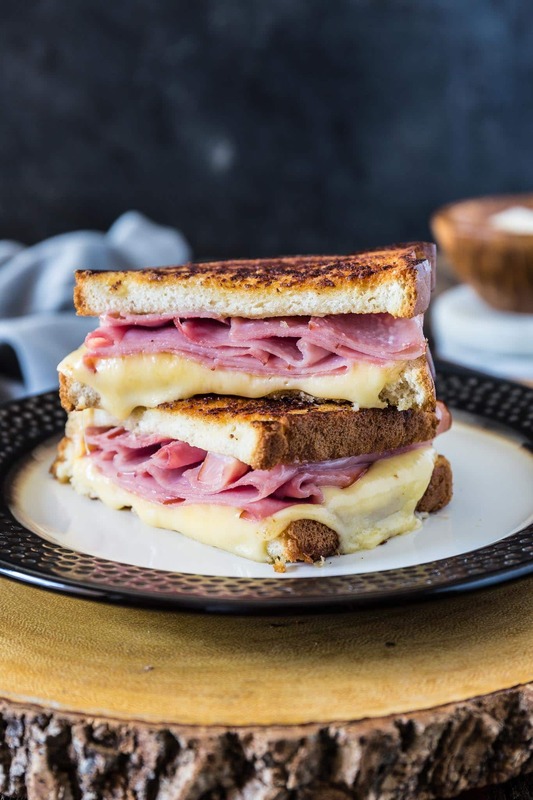 If you’re in the mood for a hearty sandwich but don’t have the energy for anything too complicated, this Gouda and Ham Melt is the perfect sandwich for you! And the best part? You only need 5 ingredients to make this. Because this pregnant lady has been going through a lot and fast and furious meals that please mamma and baby are what’s on the menu pretty much everyday nowadays. Besides, springtime is almost here – even though it is hard to believe since we just got some weird March snow here in the East Coast – and I bet nobody wants to spend all day in the kitchen, amirite? And speaking of this little fellow that has been renting out my uterus for the past 5 months, today is the day we find out if we are team pink or team blue! Oh, I’ve been waiting for this moment since the day I got a positive pregnancy test and I am over the moon. Whatever the answer is, I don’t care as a healthy baby is all I could ever want! I just absolutely NEED to start shopping for all the things baby to make this unpleasant pregnancy a little more fun. ? I promise to write an exclusive gender reveal post soon. But, for now, I don’t mean to bore you with pregnancy details! Especially when there are more imminent subjects to be dealt with. You know, like a delicious ooey gooey Gouda and Ham Melt. ??? An excellent sandwich bread: I use Pepperidge Farm Farmhouse™ Hearty White. I love it because it is big and soft and also because they double wrap it so it always tastes fresh! Ham: You can’t beat Hillshire Farm® Thin Sliced Honey Ham. It’s slow roasted for hours, sliced thin and has a touch of sweetness from the honey that really brings this sandwich to a gourmet level. Good mayo: and you know what I’m going to say, right? 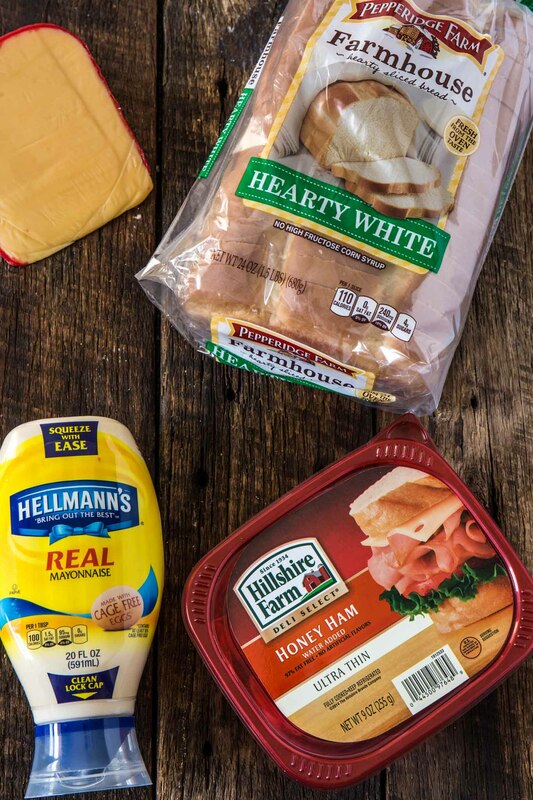 Mayo = Hellmann’s® Real Mayonnaise! Forever and ever. 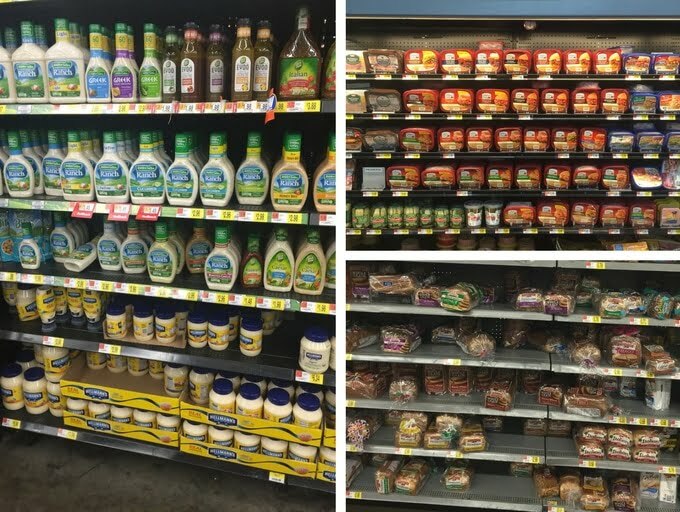 No wonder it is America’s #1 mayonnaise! ? Gouda cheese: one of my favorite varieties of cheese. Sure you could make a good ham and cheese melt with any kind of cheese. But a phenomenal melt asks for premium cheese, and Gouda is the way to go! Butter: we only buy European style butter, but any good butter will do. Whenever I’m making something simple, I make sure I only use the best ingredients as they will be the star of the show. No special cooking skills are necessary when making grilled cheese, so just let your food do the work for you! Next time you’re in the mood for a special treat, just quickly put together this Gouda and Cheese Melt. Serve it with chips or a salad and you got yourself a meal that will melt your heart! Cheesy? Me? Oh no! But this Gouda and Cheese Melt? Absolutely! ??? Spread one side of each bread with mayo. Assemble the sandwich by layering the cheese and ham on one of the breads. Top with the remaining bread, mayo side down. Spread butter on top and bottom of sandwich. Heat a skillet or grill over medium heat. Cook the sandwich for about 2-3 minutes each side or until golden brown and cheese is melted.